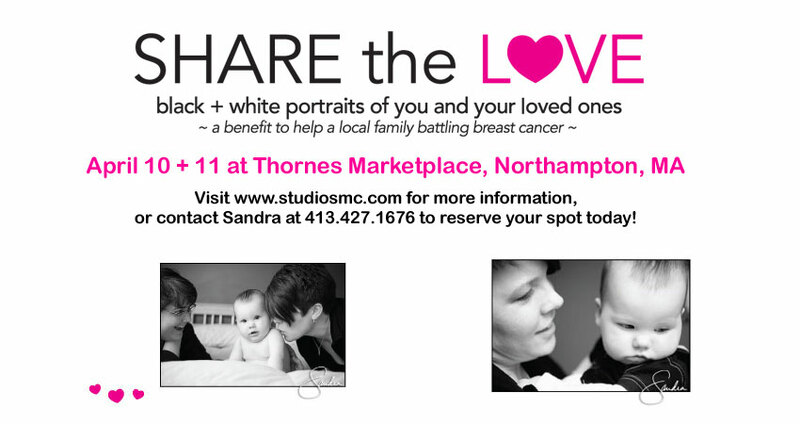 I am so excited to announce Share the Love, a benefit for a local family battling breast cancer. I will be offering mini black + white portrait sessions April 10 + 11 from 10:00 am - 5:00 pm at Thornes Marketplace in Northampton, MA. A suggested donation of $50 will be accepted for each portrait session. Reservations are recommended and can be made by calling me, Sandra Costello, at 413-427-1676. Look underneath this fancy banner for available time slots:) Please share the love and share this event!